Housing, a bumpy contributor to U.S. economic growth lately, turned downward in December, as existing home sales dipped 2.8%, according to a report from the National Association of Realtors. The annual rate of houses sold actually 2016 ended with 5.45 million single-family residences sold, the highest since nearly 6.5 million in 2006. The trade association credited a strong employment market and low mortgage rates but also pointed to a record low inventory, which has helped boost prices on a year-to-year basis for 58 months in row. The Commerce Department reported a 10-month low in new home sales in December. The annual rate of 536,000 houses was down more than 10% from the November rate and was 0.4% off the year-ago pace. Sales remain about where they were before the 2008 financial collapse but are below the 54-year average rate. A relatively low inventory of new houses for sale inched upward. The median sales price rose 7.9% from December 2015. The moving four-week average for initial unemployment claims fell for the fifth week in a row, reaching its lowest level since November 1973.Labor Department data show jobless applications below the 50-year average level every week since early 2013, a sign that employers remain reluctant to let workers go, which economists say eventually should boost wages and consumer spending. The U.S. economy should continue its moderate expansion and maybe even accelerate in the early months of 2017, according to the Conference Board’s index of leading economic indicators. The index rose for the third month in a row and got closer to its pre-recession peak. The business research group sited rising sentiment as possibly boosting economic prospects. The Commerce Department reported that durable goods orders declined slightly in December, mostly because of a slip in the volatile demand for commercial aircraft. Excluding transportation equipment, orders rose for the third month in a row. Manufacturing has been hindered by effects from a strong dollar and soft global growth. Non-defense capital goods orders excluding aircraft – a proxy for business investment – also rose for the third month in a row but remain down 3.4% from the year before. The U.S. economy grew at a 1.9% annual pace in the fourth quarter, down from 3.5% in the third quarter, according to preliminary data from the Bureau of Economic Analysis. 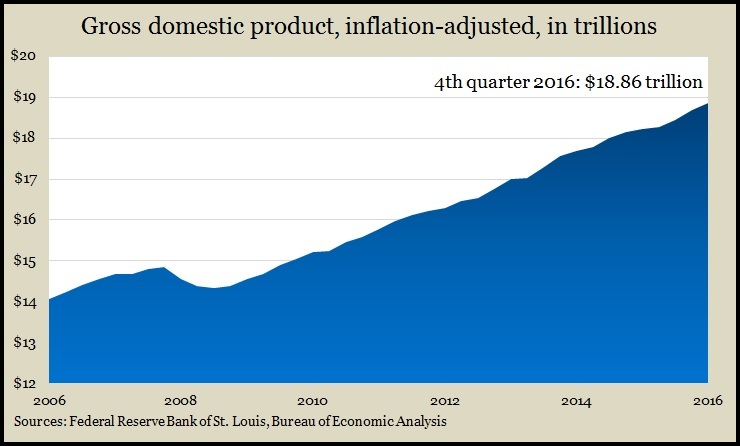 Gross Domestic Product benefited from steady consumer spending, increased inventories and additional residential spending. The report also suggested increased business investments, which have been lagging. The Federal Reserve’s favorite inflation gauge fell to 1.3%, the lowest in a year and still below the 2% mark preferred by the central bank. Considered a leading indicator of consumer spending, The University Michigan consumer sentiment index rose to its highest point in 12 years in January. A university economist said in 50 years of surveys, partisan politics has never been a more dominant determinant of consumers’ economic outlook. Eventually, he suggested, economic outcomes will temper extreme views.